In my 39 years as a public library administrator (six libraries, five states) I budgeted for, helped to plan, and participated in the annual Summer Reading Program. Sometimes we came up with our own theme and sometimes we adapted the state- or systemwide theme. Sports, travel, dinosaurs, dragons, myths, superheroes, all to encourage kids and adults to explore the riches of the library and delight in independent reading. Of course library promotion was my job, but I had a selfish motive. Each time the SRP rolled around I remembered how much I loved summer reading. All those books! All that time! This month’s block commemorates not only summer reading, but also the wonders of books all year round. It gives you the opportunity to use some of your novelty stash. Note that my samples are 10″ unfin/9.5″ fin — the size you’ll make for the lotto — but if you choose to make them yourself they can easily be trimmed so that they’ll be 9″ finished. You’ll need a 10″ square of novelty print (or a bright, busy print), a 1-1/4″ x 7″ strip that contrasts or coordinates, and low-volume medium/light blue for the background (about 10″ square). The pattern is a PDF. Be sure to print the template page so that the test square is 1″. This looks like fun! 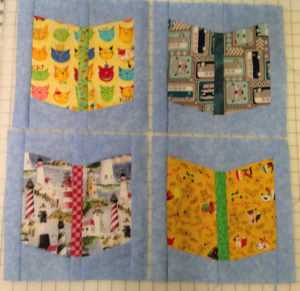 As a former teacher, a continuing book lover of all levels of books, and a former summer reading program participant from way back at dinosaur school, I love the idea of this quilt! Oops! The typing in the pdf directions for the books block is so teeny-tiny that I cannot decipher it at all. I clicked on the post header which got me to the actual post where the pdf clickable is but it didn’t print readable size in any way. My bad! I triedagain to get the pattern and clicked around and finally it got pulled up in usual read-able size. So please disregard my previous post concerning the Books blocks and miniscule type. What fun this block will be! I’m looking forward to it.